Description: Now you can journey back to the days when gentlemen took up arms to defend the South’s honor. 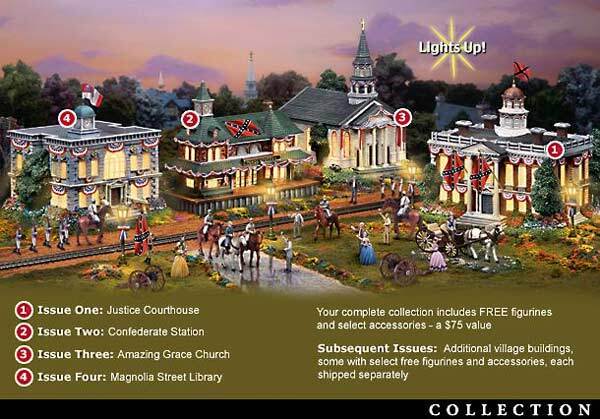 This collectible Civil War era decorative village collection invites you to begin your trip back in time with Issue One featuring the Justice Courthouse and FREE General Robert E. Lee figurine. Before long, the historic charm of your village collection grows with Issue Two, Confederate Station with FREE General Jackson figurine. Additional village buildings, each a separate issue and some with select free figurines and accessories, will follow. Available exclusively from The Bradford Exchange, Hawthorne Village Division, this collectible Civil War era decorative village collection allows you to relive the gallantry of a long-ago time with exquisitely handcrafted and detailed illuminated village buildings, each inspired by an era rich with history and culture. Imagine gathering in the town square to exchange news of the Cause and show your fervent support for the boys in gray. Watch the dashing General Robert E. Lee ride by on his stallion Traveler and admire the elegant, ornate buildings that reveal the gallant spirit of America’s Civil War South. It’s all waiting for you, but don’t delay! How much for the Sherman or Sheridan figures? I see some railroad tracks that need to be turned into Sherman’s Neckties…. I think we need to buy this village and alter its slightly. Improve on it. We could add an auction block, perhaps one where the family is being separated. We can add sound to the scene, a few heart-rendering cries, as they would say in the nineteenth-century, when a family is torn apart. You missed the whole point. What if we have a modern day village with the agony of divorce and domestic violence? Not everything has to be steeped in reality. Good lord. It’s like a fever dream of Gods and Generals, with set design by Thomas Kinkade. Where is the antebellum work force? Who does the work around that delightful looking little village? Oh snap!! It even lights up!!! Can we pay extra for the Sherman figure that doubles as a table lighter? Will we have figures of a local Vigilance Committee deciding what slaves, free blacks as well as white northerners/Northern Methodists get tortured and/or lynched to “prove” the existence of another plot to incite servile insurrection/ongoing servile insurrection that only exists in the local whites’ paranoid imaginations? Does it come with free moonlights AND magnolias? I see something terribly wrong: the library actually has the 3d National flying from the flagstaff. I was sure this was a parody until I clicked and got connected to the Bradford website. I sit at my keyboard trying to find something to say that encompasses this. The kitsch and disrespect are so blatant and mind-boggling that other reactions are frozen in a whirl of amazement. It needs a matching train set, although purists of ferroequinology will probably want to dig out a vintage model of The General. Isn’t the library itself a bit of a stretch for an “authentic” Confederate village? In addition to the auction block and slave figurines, they should add some big bales of cotton. As it is now, you’d never know the South was an agricultural society. Except for the Confederate flags, it looks more like a typical northeastern village to me. I’m holding out until they issue the Bread Riot action figures. where it belonged. Loved: “Its all waitnig for you.” It was – for my ancestors. I prefer the Star Wars village. Now that is a Rebellion I can support! Chuckle. You might should have taken a page from Dave Barry’s book and prefaced this with, “I am not making this up”. Which is more inappropriate: “Confederate Station” or “Justice Courthouse”? Actually I have a better question: Where are these things made? If they’re made in China, Taiwan, Mexico or some other developing world country, then they basically are made with slave labor.